Satellite Restaurant Chicken Rice – As old school as it gets, Satellite has been retaining that alluring charm of mosaic-tiled floors, tables with scratched surfaces, plastic chairs, and a semi-al fresco dining area on the outside complete with coolers. And according to a poll conducted by Friedchillies, this restaurant at a corner lot on Jalan Gasing was crowned the BEST Chicken Rice in Klang Valley. That’s saying a lot, as you know how densely populated KL-PJ are with all those chicken rice stalls plying almost every corner in every coffee shop in the neighbourhood. Just mention the chains of Nam Heong or New Restaurant Ipoh Chicken Rice and you get commercialized Hainan chicken rice there. Not to include the awkwardly positioned Chicken Rice Shop here, for that’s a different story altogether. Was the accolade justified? 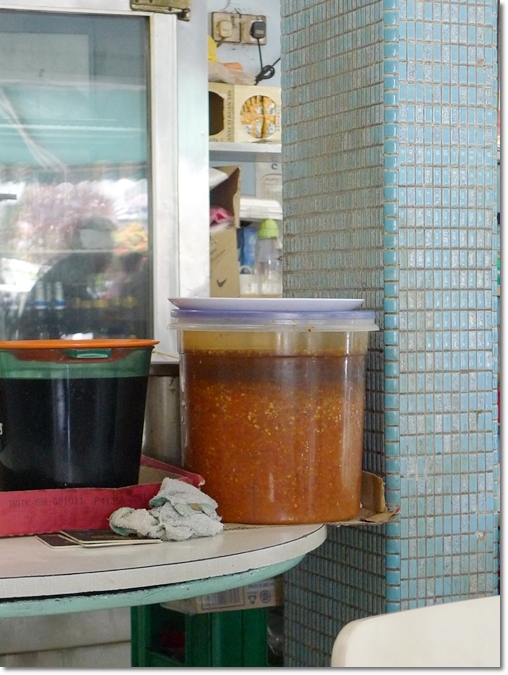 You be the judge people … or hear more from the horse’s Motormouth after the jump …..
Scarily preserved garlic chili sauce for the chicken rice? No worries, I’m sure the turn over is magnificent on a daily basis. Actually this visit to Satellite was an impromptu affair. Was at the KWSP office opposite of this, running my errands only to bump into two chicken rice specialists side by side. New Restaurant Ipoh Chicken Rice was there; in all her glory attracting the crowd in droves. And I wonder why are they sooo famous. Don’t get me wrong, I ain’t shooting blanks, for I have tasted the outlet at Midvalley once, and found that the chicken rice was nothing to shout about. At close to RM10 per serving at that. Sadly, the oil rice (is there a proper name for this? Yellow rice? Oiled rice? Chicken oil rice?) faltered where it should have been superior to the others. Lumpy, soft and mushy. Anyway, I remembered vaguely about this certain Satellite Chicken Rice, as the name stuck after the first run through several blogs on the Love Your Street Food campaign held recently. I mean, seldom do we see a chicken rice stall named as Satellite, or Cosmic, or Big Bang, etc. Walking in into the restaurant preserving the same old quaintly charm from yesteryear’s, I was surprised the next door (swankier?) neighbour was packed to the brim, and this was not even half-packed. I had my doubts, but still … I trusted my instincts (no time to check the authenticity though, as stomach’s a grumbling). 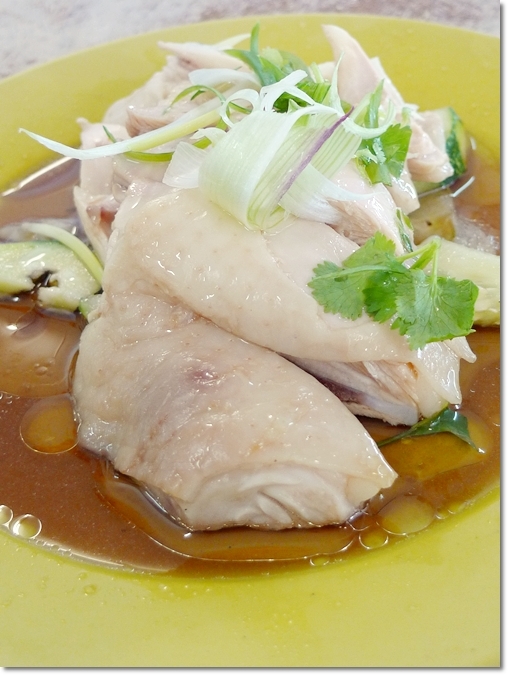 Poached Chicken (single portion) in a light soy sauce with chopped scallions and coriander. Walking past the counter, I did observe that they sell various braised meats, egg and beancurd as well as several vegetable choices aside from the roasted and poached chicken hanging for display purposes. The more chicken you display, the stronger the laws of attraction? Hehe … loosely used here. Don’t flame me. 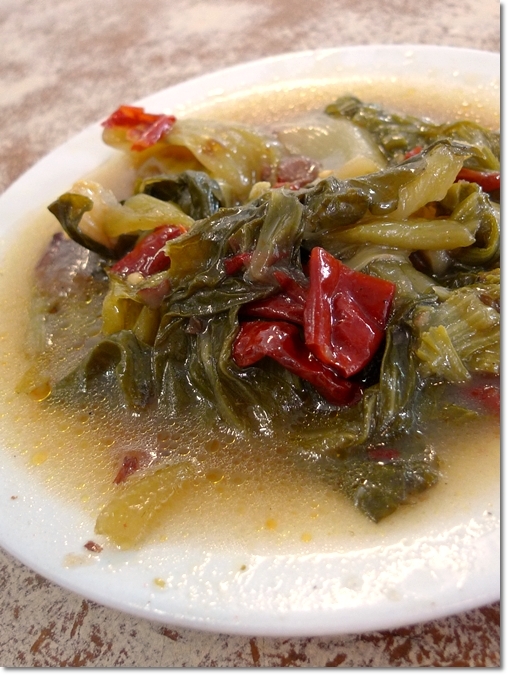 Spicy and Sour Mustard Greens with dried chillies and tamarind. The wait was not long. After all, the lunch crowd was considerably thin. The business only picked up halfway through, close to 1pm; the designated lunch hour for most. The rice did not pass the test. Lumpy with a generally lacklustre aroma, this could not have been the best in Klang Valley, in my opinion. The poached chicken was good, tender yet firm with a bite and without the unnecessary gore of biting into bloodied bone marrows. The sauce was not overwhelming nor extremely salty to steal the limelight from the chicken. But yet …. I was not sure that this deserved to be named as the champ in terms of good poached chicken. Furthermore, the accompanying chili sauce was watery, without a particularly memorable kick. Only the spicy and sour mustard greens was good enough. Not spicy at all, but the piquant flavour from the dried chillies and tamarind combination was almost spot on. But then again, this was NOT a part of the chicken rice ensemble; it was an extra order from me. 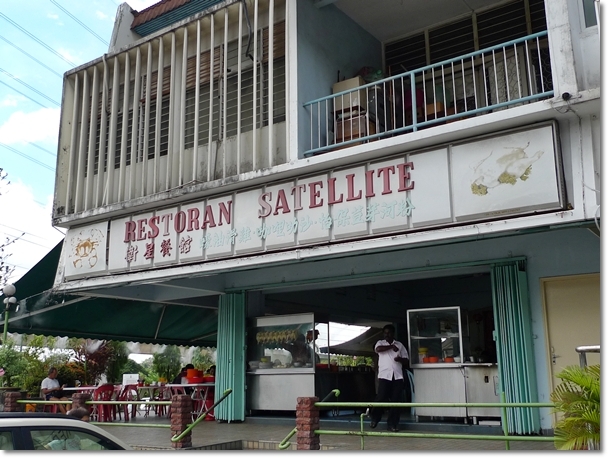 Satellite Restaurant @ Jalan Gasing, PJ – What do YOU think? Pardon me if the review sounded harsh. One of the owner of the shop, named Richard actually was courteous enough to attend to my 1001 queries. You know lah …. I was eating alone and snapping photographs, naturally I was attracting unwanted attention, like always. And no, they are NOT Hainanese, in case you had that egging question on your mind. Richard mentioned that very rarely can you find true, authentic Hainan chicken rice in the Klang Valley anymore (true?). Satellite has been around for half a century now, and certainly more experienced than the competitor next door; proudly proclaiming their heritage since 1977. Ipoh chicken rice is always cheap, good and delicious! Cheap and good, yes. Though I cannot declare Ipoh chicken rice as the best. Maybe I have not tried the best in Ipoh? Bak Gong and Rasa Sayang ain’t as good now, compared to previous days. You obviously have not tried Loke Yun Chicken Rice. The one in Ampang? Yeah, I have not. That one won some chicken rice competition few years ago too right? Yes, In Ampang town. Go try it. Then give your honest opinion. Everyone have their favourite. This is mine in KL. The wanton noodle store at the front of the coffee shop used to be very good. Wonder if its still there? Chicken rice here is so so only. Loke Yun in Ampang is definitely better. The one in the stalls opposite the police station in SS2 is also good but opens only at night. well its just too hard to find a good chicken rice, to find a chicken rice that satisfy is good enough, and for that yeah i go to satellite’s next door haha. don’t know about the mid valley outlet but i have been eating the ipoh chicken rice since i was young and its alright. Yes ah? Maybe since the expansion, quality has dropped? The Midvalley one not that memorable though. Satellite and the one next door quality did not drop. They have not improve. I am still in the quest for a good chicken rice in Klang Valley. I like one in Imbi but have not been there for a long time. Will visit & share with you. Thanks TaiLim …. let’s share on what good KL food is there to be discovered. Yeah, popularity always wins. Except this time, when a neighbourhood chicken rice stall actuall trumped the competition. Never try this but I know the other shop beside that u mentioned received many “bad” review abt their exorbitant pricing! There is a difference between Chicken Rice and Hainanese Chicken Rice. The “fragrant rice” is normally offered as an option in the latter. And it is the Hainanese Chicken Rice that I really love. And the type of chilli sauce served with it is, at least to me, plays a very important part. Gone are the days when they offered grated ginger too. They really goes well with the chicken. Ipoh’s Hoi Nam Kai Fan used to be the best but not anymore. Bak Kong in the 60’s was the best in Ipoh. Yeah, I was such a huge fan of the Bak Gong’s chicken rice, usually we did take-aways and savoured at home. But then, the last few times revealed the shortcomings; rice not as fragrant and chicken sometimes bloodied and sometimes too tough. Loke Yun’s will place two bowls of garnishing one with Chilli mixed with garlic, the other Grated Ginger :). You can take a much as you like and ask for refill if empty. If you like Chicken gizzard ask them to add more. My usual is to ‘tambah’ intestine 🙂 .. no extra charge. Soup is always vegetable base and no trace of MSG. Rice is a choice of white rice or oil rice. This place only serve the best of Malaysia fragrant rice (which is not the best in the world, but otherwise done very well). 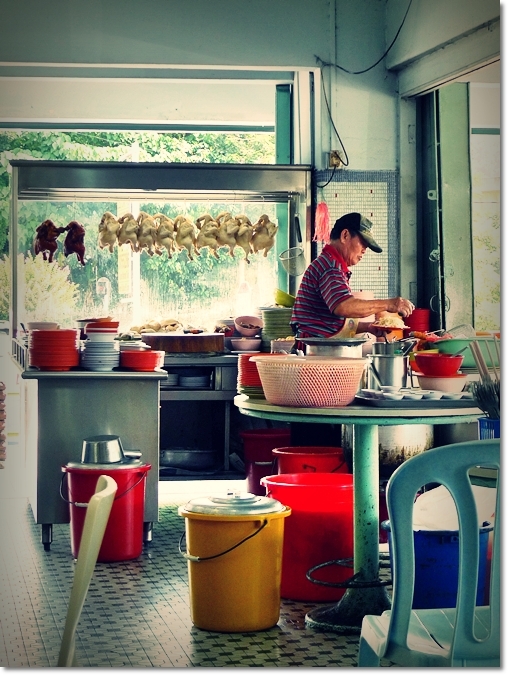 The restaurant is the cleanest Chicken Rice shop you can find anywhere in Malaysia. My usual is chicken wing. They will give me more than one wing tip. You mention that and he will know who recommended them 🙂 However be warn, I am bias. Best you go try and give your honest opinion. Haha … CS, that sounded like a whopping chicken rice experience; overloading on the rice and gizzards? I like chicken rice that is very fragrant (never mind the oil or the fact that they’re putting in thousands of calories), and to me … the chicken comes a close second. And the sauce as well. But the rice must be really good. Okay, you got me tempted now. Loke Yun’s high up on my priority list now. 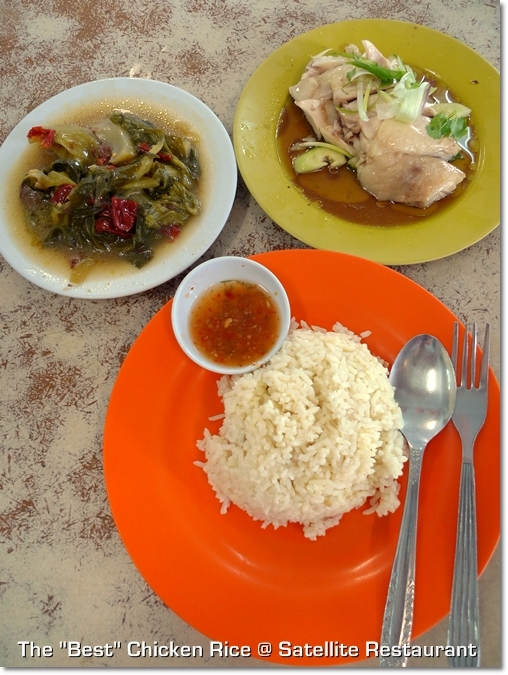 Last I went, the chicken rice in Hat Yai, Thailand is darn good !! YES! Thai style of chicken rice is GOOD I tell you. VERY good, somehow the rice seems to be separated into grains, like nasi pulut yet fluffy enough. And the poached chicken usually is very tasty without the need for soy or chili sauce. Now you mention the rice, Otak Otak Place actually serves one of my favourite oil rice – fragrant, piping hot and separate grains. Yes ah? Been some time since had a real meal at Otak Otak. Usually take their milk tea only, very milky and comes with a piece of cracker. Penang eh? I have had a few good ones, though usually we did not go for chicken rice when eating outside. Somehow we tend to try the various noodles like Char kuey Teow, laksa, hokkien mee etc rather than rice dishes. I think this is really a very over-rated place. Much better chicken rice can be had elsewhere in KV! Yeah, thank you for sharing that same opinion. And I was having high hopes, being the best and all. I actually don’t mind eating here, since it’s pretty near my place. But it’s definitely not the best. You’re around Jalan Gasing ah? This look quite good, but we prefer chicken rice in Klang, one located at old Emporium makan and another one serve with white chicken in Taman Eng Ann. I tried one chicken rice, siew yoke and char siew somewhere in town. But forgot the name. Like in the middle of a business centre like that. for some reason Jenn & I seldom eat chicken rice… don’t ask me coz I don’t know the answer! much like I never liked Old Town White Coffee outlets. 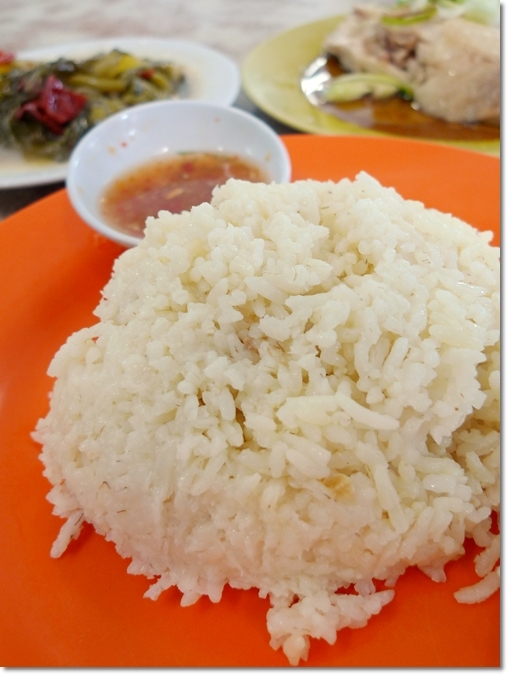 I suddenly miss eating chicken rice…..have you tried the batu lanchang hainan chicken rice?yummy…oops…sudden craving! i think midvalley chicken rice is good also..;)..and in ipoh the one near tesco (can’t remember the name as usual)…quite expensive but somehow taste good.the chicken skin is crispy and portion served is large. Near to which Tesco leh? You never suggested anything one, back then ….. Now only you talk when I am already here. Ahem. Keep your food trip coming… love going to the places you have been to! USJ ah? Wah .. the to-eat list gets longer day by day … okay okay. Subang is near to my place, so it’s all good. But why the …erm, caressing eh?!! Thanks CS Chua,the Loke Yun’s chicken (with the yellow skin) rice store reminded me of my late father’s Haininese chicken rice shop in Ipoh. I believed my father started the first Hainanese chicken rice store in Ipoh a few years after the Japanese occupation in Malaya. I grew up eating it almost everyday from 1948 to 1958.For the readers who are from Ipoh,please ask your grand parents for help in finding the name of my father’s chicken shop. ( My father shop was at the corner of Theatre Street and Anderson Rd, next to Bak Gong,it was started a few years before Bak Gong existed.) The first reader (Motormouth excluded) to correctly name my father chicken shop will be my guest in my makan crawl to devour Ipoh using Motormouth’s famous Ipoh Food list plus heaps of DVD food series recorded in Australia.J2KM ,I hope you don’t mind for using your blog for reminiscing the past. Oh btw how far is Ampang from the Berjaya Times Sq.Hotel ? J2KM, is there any Seafood buffet advertise for the month of January 2011 by the big hotels in KL? I would like to invite you and a friend to join us for dinner if you can spare the time.I will be staying at the BTS hotel from Sat 15/01/11 to 22/01/11 and staying at Pasir Puteh,Ipoh from 30/01/11 to 04/02/11. Merry Xmas and a very Happy New Year to you .See you in KL soon!!!!!!!!!!!!!!!!!!!!!!!!!!! it’s name wong kong restaurant. The only chicken rice that comes close to Loke Yun in KL is Wong Kee in Ipoh. consider the best. You need to try and give your own rating for it. I like Loke Yun better. Come James … we go next weekend. A very big “THANK YOU” to Prisca for being the first reader to correctly named my late father’s shop.My late parent’s spirits would be delighted to know that there’s someone still remember their shop after so many years.A relative of mine Madam Heng still run a businese at Canning Garden (Roast Duck and Honey Chicken ) Prisca you have won “FOOD SAFARI ” series 1,2,and 3/ “PLANET FOOD”/ “TASTE”/ “TETSUYA WAKUDA” who has just recently opened his latest Restaurant called WAKU GHIN’ at the new casino Marina Sands Hotel in Singapore, POH’S KITCHEN shot in Malaysia/ RICK STEIN’S FOOD series of CAMBONIA,THAILAND,VIETNAM,MALAYSIA,BALI,SRI LANKA and BANGLADESH and I am currently recording LUKE NGUYEN’S VIETNAM street food series 2 part 4 tonight. Motormouth will be given all of above items as well as I would love to share with all food lovers in Malaysia and Singapore.Prisca please leave your mobile phone number and email address with Motormouth so that I can contact you later. Once again a million thanks to James for bringing back half a century of fond memories of my youth. Oh one more big favour I would like to ask Motormouth’s readers “Are there any old ANDERSONIAN class of 1956 and especially the school 1st XV team still out there?” Please contact me via this site. Here’s wishing Motormouth and all your readers a very “Merry Christmas and very Happppppppppppppppppy New Year in 2011. Steve, Quote “there’s someone still remember their shop after so many years” unquote. You got to be kidding. Wong Kee is famous. Everybody in Ipoh know Wong Kee. Whenever I go north and back I will turn off at Ipoh and go to Wong Kee, likewise when overnight and that when I will go for Ipoh’s snow beer. Hi James, I will be in KL staying at the Berjaya Times Sq.hotel from Sat.15/01/11 to 22/01/11 then off to Singapore for 3 nights to meet my son and back to KL on 25/01/11 till 30/01/11. Hotel not decided yet maybe Nikko. Sunday 30/01/11 shoot up to Ipoh staying at Pasir Puteh for family reunion. Is Soon Fatt a good Restaurant to book for family reunion dinner? May extend stay in Ipoh after 04/02/11,then Penang. All together 5 weeks in Malaysia and Singapore then back to Sydney from KL on 18/02/11. Pls email me your mobile no: so I can contact you before we depart Australia. Just heard the good news—— our Aussie Dollar has reach parity and beyound the USD.Time to change AUD to RM (A$1 =3RM). Now I can buy 1 and get 2 free. Ha Ha . I am thinking of buying the Apple macbook air there . Is it cheaper in Singapore or Malaysia? Well James see you in KL soon. Have a merry xmas and happy new year to you . LET”S PARTY!!!!!!!!!!!!!!!!!!!!!!!!!!!!!!!!!!!!!!!! Perhaps Pak Kong’s commercialisation of it’s trade has made it’s quality deteriorate but I rather felt Hin Loong @ jln Ali Pitchay is one of the best one around in Ipoh serving quality Hainanese Chicken rice now. If you look further, there’s one deserve a mention is Kok Beng Chicken Rice in Taiping. Food quality is good and delicious too. A must try for chicken rice lovers! Haha …. very subjective sam. This WAS voted the best chicken rice, but then again …. did not perform its magic on me. You want the bean sprouts chicken type of bak cham gai? or chicken rice stall version?